Russian President dismisses any suggestion that Syrian President was behind April chemical attack. 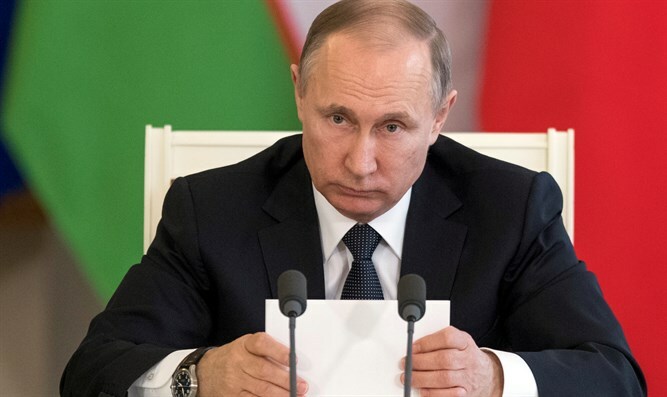 Russian President Vladimir Putin dismissed on Tuesday any suggestion that Syrian President Bashar Al-Assad's forces were behind a chemical attack that killed scores of people in Khan Sheikhun in the Idlib province in April. "According to our information, there is no proof that chemical weapons were used by Assad. We are convinced that he didn't do it," Putin told the French daily newspaper Le Figaro, as quoted by Reuters. The remarks by Putin, a close ally of Assad’s, came a day after French President Emmanuel Macron, whose country's intelligence services in April blamed Assad for the Idlib attack, said the use of chemical weapons in Syria was a red line for Paris and would result in reprisals. Putin said he had offered to arrange inspections of the site in the town of Khan Sheikhun, but that all the major powers had refused. He said the objective of the allegations had been to discredit Assad and put pressure on him. It was a way of "explaining to the international community why it was necessary to continue to impose measures to pressure Assad, including militarily," Putin said, according to Reuters. Earlier this month, Human Rights Watch said there was a "clear pattern" of chemical weapons use in Syria that could amount to crimes against humanity.